Squash is a prolific veggie. Summer gardens are often so overloaded with zucchini & summer squash that although you anxiously enjoy it the moment it’s harvest-able in the spring, soon your family tires of squash every night. You then attempt to preserve some for winter months but still that squash harvest keeps coming Every. Single. Day. Finally in a futile attempt to dodge being consumed by the giant growing mountain of squash you start giving it away to grateful friends and family… for a while. Soon even they run when they see you coming toward them with yet another squash harvest in hand. You can’t stand to see that beautiful garden produce go to waste. 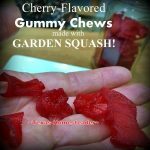 But “What’s a girl to do?” you wonder to yourself as you slowly disappear beneath the growing squash harvest pile… Recently I was skimming my Facebook newsfeed and I saw someone post about making a sweet chewy treat from overgrown excess garden squash. Whaaaaaa….??? I’m intrigued! RancherMan is a grazer, and he loves to grab a handful of something to snack on throughout the day. Lately he’s really enjoyed dried fruit such as cranberries or raisins. But, you know, that gets expensive after a while. 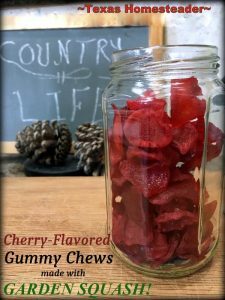 I saw on my FB newsfeed that Common Sense Home had made their excess squash into a sweet gummy chew and I wondered if this would satisfy RancherMan’s sweet/chewy snack urge. (you can see their post here) So I sat out to experiment. Now they used juice concentrate to make their chews. But I wanted to use what I had on hand. RancherMan suggested lemon flavor. Although I was skeptical, I made a lemon concentrate by first making a simple syrup and adding bottled lemon juice. But when RancherMan tried these lemon-flavored chews he was not wowed. He said there was not enough fruit flavor, and still too much squash flavor. I tried rolling them lightly in powdered sugar to reduce the tartness of the lemon but they were still not what we were looking for. He suggested I try grape flavor. Hummm, really? I’m skeptical that grape flavor would work either but I’ll see what I can do since, you know, I still have so much squash coming from the garden. eh hemmmm. For the second attempt I made my simple syrup and flavored it with two packets of powdered unsweetened grape drink mix. These finished grape-flavored chews were indeed stronger flavored but I was distracted and left them on the dehydrator a little longer than I’d like. Although they still turned out chewy and had a stronger fruit flavor than the lemon flavored chews did, RancherMan was still not wowed. (back of hand to forehead in dramatic Gone-With-The-Wind flair) I’ll not be deterred, I’ll NOT! Batch Three: Cherry Flavor Is A WINNER! I thought perhaps I should use a stronger-flavored fruit such as cherry. So for the third attempt I made my simple syrup of 1 part sugar to 4 parts water & stirred in two packets of unsweetened cherry drink mix. Since I had black cherry concentrate in the fridge I went ahead & added about 2 tablespoons of the concentrate too. Use Whatcha Got, y’all! I simmered the syrup until all sugar was dissolved and then turned off the heat & turned my attention to the mountain of squash on the counter. I washed, trimmed and peeled my squash and then cut it into lengthwise quarters & scooped out the seed section with a spoon. Some of my ‘normal sized’ squash were thin boats by the time I scooped out the seeds. So from now on I’ll go ahead & allow the squash to grow into larger overgrown Franken-Squash before I harvest them for my gummy treats. Then I cut the squash a litter larger this time into about 1″ to perhaps 1.25″ chunks. The dehydration process removes most of the moisture so they shrink quite a bit. 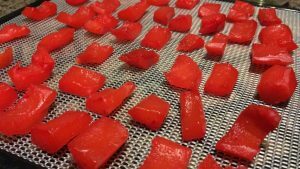 These larger chunks allow the chewy texture to remain when they’re done dehydrating. Now I turn the heat back on to heat my simple syrup and I add my prepared squash until the chunks were just barely covered by syrup and simmered them for 30 minutes until the squash was lightly tender. I still had prepared squash waiting so I used a slotted spoon to remove the cooked squash into a colander and added the next batch of cubed squash to the syrup and got it simmering while I was finishing up with the first batch. While squash batch 2 is simmering I thoroughly drained the previous batch of cooked squash and laid it onto my *Excalibur Dehydrator trays. I tried to evenly space them without allowing them touching each other. When all my trays were full I placed them into my dehydrator set to 135 degrees and dehydrated them until they were still tacky but no longer actually sticky. The time for this step varies based on your location, your humidity level, how thick you cut your squash chunks, etc. It can be anywhere from 8 to 12 hours. Mine was about right in 8 hours. But after I turned off my dehydrator I left the trays inside it overnight just to make sure the pieces were completely air dried. Now that my cherry chews are done I can place them in a jar and store them in the fridge and eat them over the next 30 days or so. But mine never even got to that stage! I put them in the jars and left them on the counter with the lids loose in the event any moisture remained. But RancherMan raved and kept coming back again and again grabbing handfuls of these treats. I’d say this was certainly successful – he’s still raving! I’m able to provide RancherMan’s sweet chewy treats but I’m not having to purchase them. 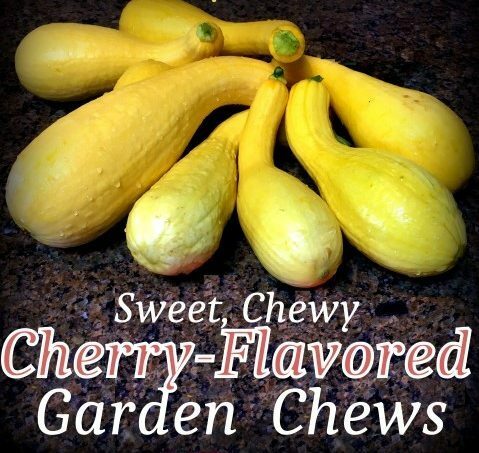 Plus these chews are making good use out of my mountains of garden squash (both yellow summer squash and overgrown zucchini). Is your garden giving you TONS of squash? Have you ever heard of making a sweet treat with it? OMGosh y'all - you're gonna love these cherry gummy chews made from squash! Prepare squash by washing, trimming ends, and peeling. Cut squash in half and then in half again longways. Scoop out seeds with a spoon and cut into chunks of about 1 to 1 1/4 inches. Make enough simple syrup to barely cover your prepared squash in a ratio of 1 part sugar to 4 parts water. (For a medium-large saucepan - dissolve 1 cup sugar into 4 cups water) Add 2 packets of unsweetened cherry drink mix and optional cherry concentrate if desired. Simmer while stirring to thoroughly combine & completely dissolve sugar. Add prepared squash to cherry syrup until squash pieces are just barely covered by syrup. Simmer 30 minutes until squash is lightly soft. Remove with slotted spoon into colander. Place cooked squash onto dehydrator trays, spacing evenly without pieces touching each other. Place trays in dehydrator set to 135 degrees. Rotate trays every couple of hours for even dehydrating. Gummy chews are ready when they are soft and lightly tacky but no longer sticky. Store in glass jars in the refrigerator and consume within about 30 days or so. 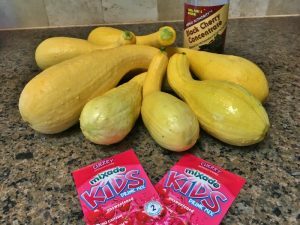 This entry was posted in Blog Posts and tagged Food Preservation, Frugality, Gardening, Make-It-Yourself, Summer on August 21, 2016 by Texas Homesteader. My dehydrator is a dinosaur……….would you happen to have instructions for oven drying, or dehydrators with no heat regulators? Wow! 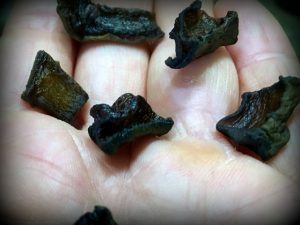 I had never thought of making gummy chews before. Thanks for sharing your tips and favorites on the Country Fair Blog Party! Good morning! Just a little note to let you know that this post has been *FEATURED* today on the Art of Home-Making Mondays at Strangers & Pilgrims on Earth! 🙂 Thank you for linking up with us! Not sure where my comment went. I think this is a fabulous way to get kids to eat squash. Awesome recipe. We thank you for sharing your creativity at DI&DI. What an interesting idea! Thanks for sharing on the What’s for Dinner link up and don’t forget to leave a comment at the party – Next week’s features that also leave a comment get pinned and tweeted! I had no idea you could do this! Pinned for later. Thank you for sharing at Merry Monday! I have such a sweet tooth! This is a way to satisfy that and actually get more veggies. Win-win! I just wish we still had squashes that were producing. I’m going to keep this in mind for next year! Thanks for sharing on the #wastelesswednesday blog hop! This is the neatest thing! I can’t get anybody to eat squash anymore… And the thought of using those Franken-Squashes that seem to mutate overnight – I’m so excited to try this!